A zero boil-off cryostat for the cooling of the Cryogenic Current Comparator and Josephson Array Inserts is now available from Cryogenic, as part of standard product range for Metrology. The cryostat is cooled by an ultra quiet pulse tube cooler which provides ½ Watt cooling power at 4K. It has a special heat exchanger facility for liquifying helium gas from room temperature. There is a radiation shield to intercept external radiation running at 50K. A special gas/liquid convection tube transfers cooling power from the cold head to the liquid helium reservoir and avoids thermal fluctuations that could avoid affect the squid. Tests have shown that the measurement performance of the CCC and the SQUID are unaffected when the pulse tube cooler is running. 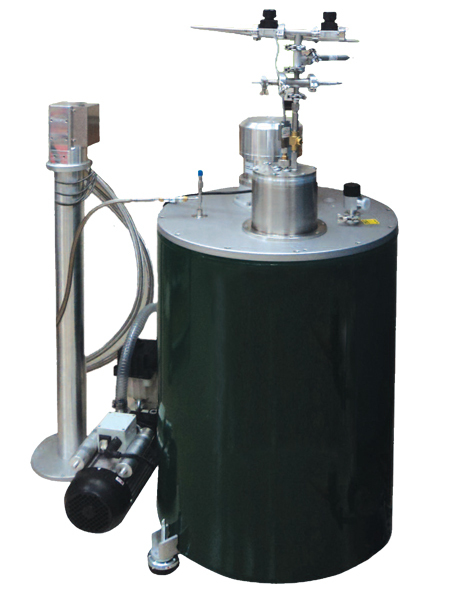 A standard helium gas cylinder 10 cu meters (250 cu ft) is required with pressure regulation (0-30psi) to be supplied by the client. The gas should be 99.998 % purity or better. The gas supply is connected to the cryostat and as the system cools down it is condensed into the cryostat providing a small liquid reservoir, nominally 5 litres of liquid helium at 4K. The rate of liquefaction is 150 cc per hour and if the helium level is steady more than 250 milliwatt can be absorbed at 4.2 K. Prior to cool down the cryostat should be flushed with helium preferably by using a small vacuum pump. A lakeshore temperature controller can be used to both monitor and control the bath temperature to the sub milli-Kelvin level. The recommended maintenance for the pulse tube cryocooler is every 30,000 hours of use which is only every 3 to 4 years of continuous operation. This helps to keep all operating costs to minimal.